Working. That's right, folks! I am an official, contributing, tax-paying member of this world once again. I've got health insurance and everything (although, we'll be sticking with Gui's health plan since it's much cheaper and way better)! My job? It's at a company I worked for before I left Austin back in 2007. Back then, I was working in the legal department dealing with contracts and stuff, now I'm assisting the VP, working with buyers and running reports. Admittedly, it's not my dream job, but it pays the bills and I'm having fun so far. Not to mention getting free goodies for my hair. 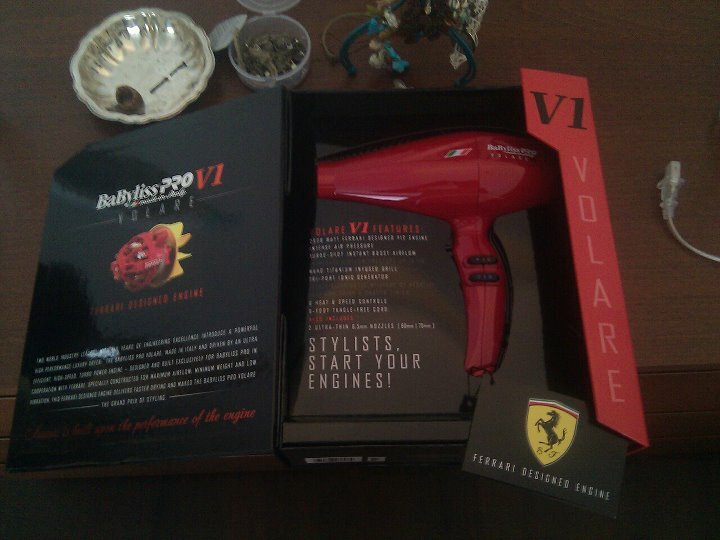 Have you ever used a hair dryer with a Ferrari engine? Getting ready to go back to school. I've decided to finally give it a go and take a few classes to get my CPA. Classes start next week, and I have to admit that I'm kind of terrified. Accounting? Haven't done that in ages. But, I'm kind of stoked that I'm finally doing something I've been saying for so long now I wanted to do. I just hope I don't find myself feeling like I'm way in over my head - especially since I'm plunging in with 3 classes in the first semester. Gulp. Moving into our own place. I feel like I've been moving for a century now. Tuesday will be a month since we "officially" moved into our own place, but we're still barely settling in. We have about 30% of the furniture we need - still working on getting a bed, some shelves and more seating options. The place is a brand new construction, and we had it a little rough at the beginning of the month with developers falling through on warranty issues for repairs, so now, we're aiming for September 1st for when we'll finally be "settled" in. Honestly, we really, really love our new place. It's a small (13 unit) complex in an unbeatable downtown location, with lots of modern charm and brand new everything. I just can't wait to have time to sit back and enjoy the space. Waiting on people. With moving, comes lots of waiting on people to come by and hook things up, deliver stuff and repair things. We've been doing lots of that lately. Our new place has no closets, so we had someone come in and install a shelving system, then there was the mess with the internet guy who finally came by 3 weeks after ordering the installation, and the water guy to find out why our water isn't working and the couch delivery guy and the bed delivery guys, etc. The hardest part about waiting was not having internet to pass the time. My iPhone was getting a lot of love until the cable guy finally came to install the internet. Spending time with family. I got to see a lot of my mom over the summer (perks of being a school teacher), and it was so nice to have her here during such a hectic month. She helped me out a ton during my move, and we caught up on life over lunch at good ol' Luby's. My nephews also spent some of their summer vacation in Austin and Guillaume and I were lucky enough to spend a lot of time with them while they were here. It was so much fun kicking back like a kid, staying up late eating junk food and splashing around in the pool all day. It had been about 7 months since I last saw them, and I couldn't believe how much they'd changed! Still cute as ever, though. So, I'm back now! I feel like I've been away from blogging so long that I don't know where to begin! But, I have lots to say and share (going to Philly in a few weeks and the belle-mêre is visiting soon), so do stay tuned. dude! I NEED one of those hair dryers...seriously! how cool! glad we got to see ya'll too...missing whataburger and breakfast tacos, though not breakfast tacos FROM whataburger, but you know what i mean.....thanks for letting us break your new place in. it was wonderful! see you soon hopefully! Welcome back and congrats on the new job!